As things stand, Esher occupy a spot in the drop zone and they are one point adrift of safety heading into Round 21. The team sitting directly above Ricky Nebbett’s men are Stortford, who climbed out of the relegation places last weekend following a run of three straight victories so this could be a lively affair in Surrey. Rivals Birmingham Moseley travel to promotion chasing Rosslyn Park to begin February while bottom of the table Loughborough Students take the trip to league leaders Old Elthamians, aiming to upset the odds once again. OEs are currently level on points with second-placed Ampthill and District, but the A's clash with Caldy has been postponed so Old Elthamians an fellow title candidates, Blackheath who entertain Cambridge, will be keen to take advantage. Elsewhere in National One, Plymouth Albion face Cinderford as two form sides clash in Devon while Rotherham Titans against Chinnor & Darlington Mowden Park v Sale FC have been called off due to the bad weather. It is top against bottom in National One to begin February as league leaders Old Elthamians travel to Loughborough Students. OEs moved back to the summit of the division in Round 20 as they clinched a bonus-point win over Sale FC whilst title rivals Ampthill and District could only score three tries in their victory against Cambridge. Both teams are now level on points at the top, but OEs currently hold pole position because they have won one more game than the A’s this term. Next up for Gavin Lach’s men is a trip to Loughborough and usually when two sides from opposite ends of the table meet, the result favours the club which is flying high, but the Students defied that logic last week. Alan Buzza’s side claimed their first away win of the season against fifth-placed Rotherham Titans and it means the Midlands outfit are just five points shy of safety. Could they upset the odds again and topple the league leaders? Rosslyn Park asked for a reaction in Round 20 and Kieran Power’s side delivered. Following back to back defeats, the men from the Rock were itching to end January on a high note so a victory over fellow promotion candidates Blackheath was exactly what they were after. The win for Park lifted them to third in the table and now they sit four points behind the leaders as they prepare to travel to Birmingham Moseley this weekend. In terms of the hosts, they have had mixed fortunes of late. After narrow defeats against both Rotherham Titans and Old Elthamians, the Midlands club could have snatched a victory over Darlington Mowden Park last weekend, but after Jacques Le Roux’s late try, the conversion couldn’t be added. Moseley had to settle for draw, but their recent encouraging displays have left them just one point adrift of safety. There were certainly positives to take for Richard Protherough’s side in January and they will now be aiming to build on their improvements in their first fixture of this month. It was a tough end to the month for Blackheath. Following their excellent win over Darlington Mowden Park in Round 18, ‘Club’ moved to the summit of National One, but consecutive defeats against fellow promotion challengers Ampthill & District and Rosslyn Park have put a small dent in their title aspirations. Three losses from their last four games means James Shanahan’s side are now five points off the top, but it is not disastrous by any stretch of the imagination for Blackheath, who take on Cambridge this weekend. The visitors to Well Hall take on another side fighting towards the top of the division after losing out to Ampthill and District in Round 20. Richie Williams’ side are now just two points clear of the bottom three after a tricky run of recent fixtures and the final third of the campaign begins with another difficult task for the Blood and Sand. After defeating Ampthill and Rotherham away from home earlier in the season, Cambridge will know they do possess the quality to get the better of another frontrunner on Saturday. 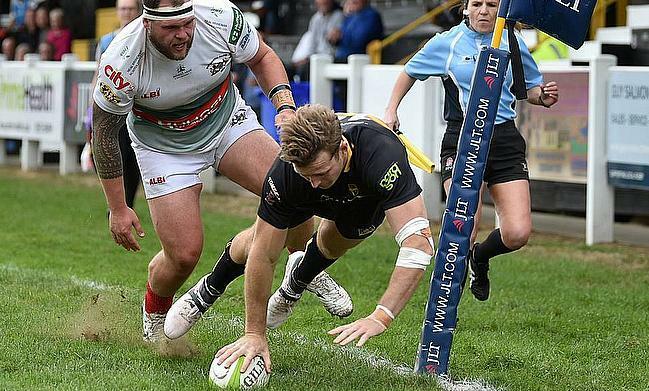 Both Cinderford and Plymouth Albion have enjoyed a very pleasing month in National One. The Foresters have picked up four wins from their last five matches to solidify their place in the top half of the table whilst Albion have accumulated six victories since the beginning of December which has completely transformed their season. The sides meet at Brickfields this weekend with Cinderford one position and two points ahead of their hosts as things stand. Paul Morris’ side have regrouped superbly after a blip in form towards the back end of 2018 and they will be hoping they can get stop the Plymouth resurgence in Round 21. Kieran Hallett’s men were, at one stage, languishing in the bottom three, but they are now showing their true colours as we enter February. Both sides are in excellent form so something has got to give in Devon this weekend. After January was dominated by the engrossing title race in National One, February begins with the spotlight on the relegation battle as Esher and Bishop’s Stortford collide in Round 21. In truth, Stortford have a very strong case to why they should’ve grabbed the headlines last month as Andy Long’s side have turned their fortunes around. Three straight wins, including a fine victory over Chinnor last weekend, means the Hertfordshire club are now one point clear of the drop zone. Stortford’s renaissance has seen Esher fall back into the bottom three. Ricky Nebbett’s side sit 14th in the table, but they have a wonderful opportunity to climb out of the relegation places when they host a rival this weekend. Despite their 26-0 loss to Cinderford in Round 20, the men from Molesey Road may be carrying some confidence into this Saturday as they have won their last two home fixtures. A hat-trick of victories in Surrey would be the ideal start to February for Esher.